We just released No Time To Explain on Xbox One, and a "Remastered" version on Steam. The game's finally been rebuilt in a proper engine (Unity), with developers who actually know how to code games. Neither Tom Brien or I -- the pair who started tinyBuild four years ago -- know how to code properly. We can do rapid prototyping, but we're in no way professional programmers. This is one of the main reasons why the original release of No Time to Explain sucked. I've had this weight on my shoulders for four years, and it seems the right time to finally tell the story of how tinyBuild was nearly killed off before it had even begun. This is also an explanation of why the original release of No Time To Explain had so many issues. Reply after countless mails. Saying they are canning multiple projects. "I regret to inform you that my bosses decided to terminate the contract. Sales of smaller and casual games have collapsed since the beginning of the year, we need to cancel several projects, including No Time To Explain. We wish you luck with your project"
It turns out that their move into publishing smaller indie games hadn't exactly gone well in the last few months. 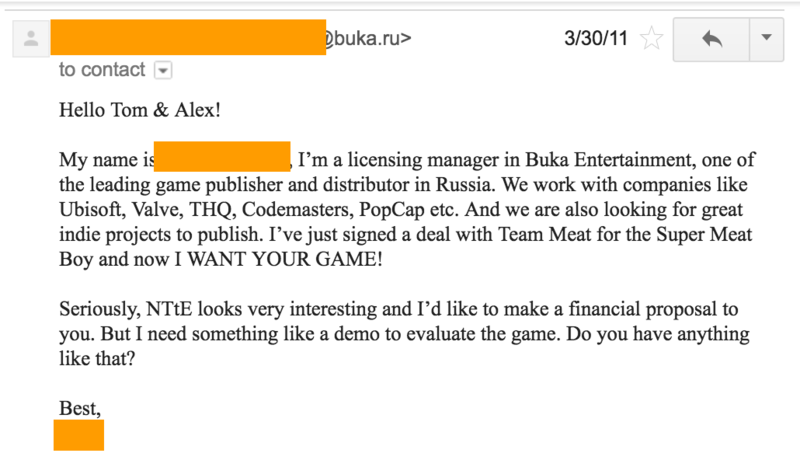 This was right after they had released the Collectors Edition of Super Meat Boy in Russia, which this guy also gave me as a present during our meeting. It seems like the sales didn't meet expectations, and they decided to can all financing. 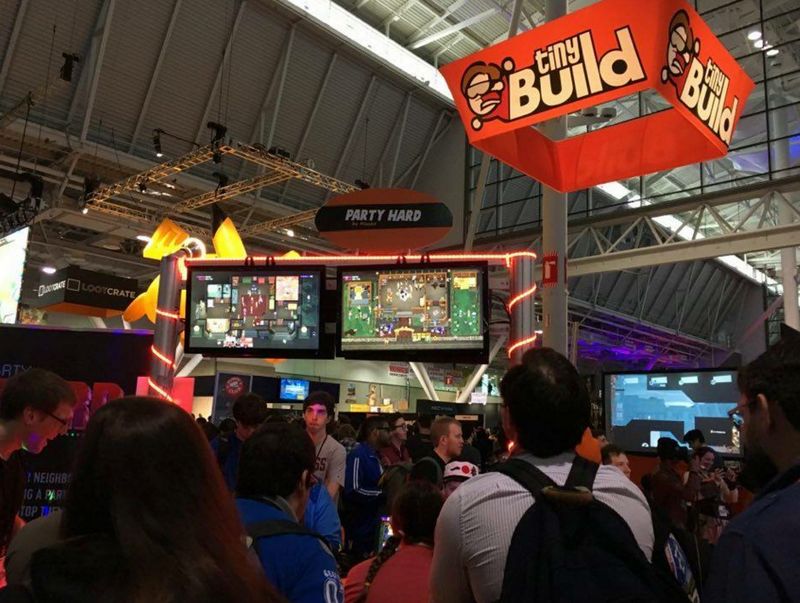 We did what we're still doing at tinyBuild to this day -- we decided to wing it. Steam didn't want to publish the game based on our hacky prototype (and probably for good reason), so we came up with an idea. We'd split the game into two "Seasons", using the first half of the game that we'd already built as Season 1. We had absolutely no money left to survive building any more of the game, so releasing it in two parts was the only solution we could find. We had no choice but to stick with the hacked together codebase, hoping to duck tap it together as we went. Season 1 was set to release in August 2011, and would sell via our own website and a couple of smaller distribution sites. By launch, we were able to stabilize the code. It didn't have many framedrops, full-screen kinda worked most of the time, and we even pulled together a level editor. Windows 7 was helping a lot by handling Flash-based applications really well. And remember that we're talking about an ActionScript 2 codebase here! We released the game, and thankfully the fans were mostly happy -- we received a nice amount of press coverage, although definitely not as much as if we'd released on Steam. We made about $10k in sales which was enough for us to hack away at Season 2.
t just so happened that this is where I became friends with Luke Burtis (the now other founding member of tinyBuild) and his wife Yulia. Yulia is best friends with Lerika, who came to Vegas with me as my girlfriend of 3 weeks at the time, in November 2011. We got married there right after Minecon, and are still happily together. But on the No Time to Explain front, it was quite the opposite of happy times. After the Vegas adventure, No Time To Explain Season 2 was finished and released in December 2011. The release saw a sales spike of around... well, next to zero sales. It was around those weeks that tinyBuild died. As you'd expect, it was pretty awful and depressing. 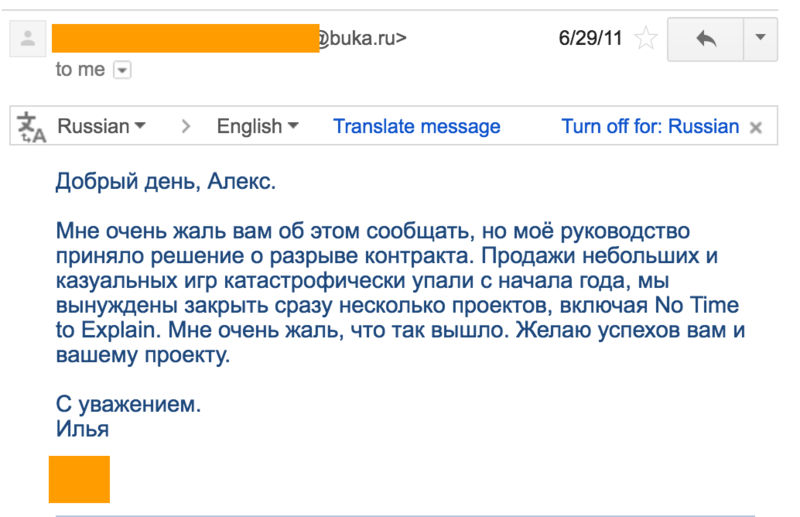 2012 started with depression and broken dreams, but the end of the year had resurrection plans for tinyBuild. Steam Greenlight came along, and we thought what the hell, let's submit the game. I remember refreshing the submission page, waiting for it to open, and then rushing to submit No Time To Explain as soon as the form opened. We were amongst the first few dozen games live on there. As it did with the Kickstarter project, the trailer sold the game. Universally loved. We got Greenlit in the second batch, and that's when most of the press found out about No Time To Explain. We were Greenlit in October, and planned to release in December 2012. I remember that moment of me & Tom talking on the phone, screaming out of shock and happiness. A year and a half later of broken dreams, it seemed like we would finally get on Steam. But guess what? Things didn't go as expected. Bet you saw that coming. When we merged the two "Seasons" together, it was a giant ActionScript 2 mess that barely worked. We spent numerous extra months optimizing the code, trying to make things work. The eventual solution was to wrap the ActionScript 2 SWF into an ActionScript 3 container ("a game in a game"), and have an executable call up that AS3 container, and connect to all the Steam APIs via extensions. We had loads of help here from the Flash-on-Steam community of game developers. It was an abomination, but it kind of worked. Until it didn't. 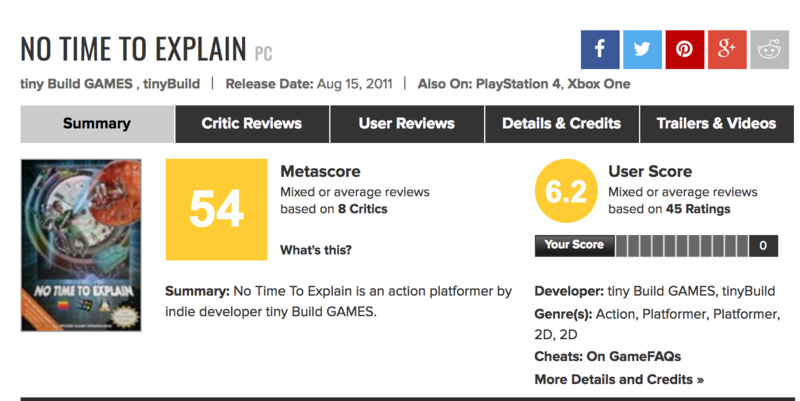 We released in January 2013, and the reception from the press was mostly negative. See, by that time lots of the press had upgraded to Windows 8 and, as it turned out, Flash-based games just plain would not work properly in Windows 8. Framerate drops. Unexplainable bugs. It was a mess. If anyone had a custom cursor enabled - the game would run very slow. If you had a second monitor plugged in, the game would crash. No controller support. No proper full-screen. The Binding of Isaac was also ActionScript 2 and faced similar problems. On launch day, I remember sitting there smoking (I don't smoke...), trying to calm myself down while reading the reviews, watching GiantBomb's Lets Play, TotalBiscuit's "WTF Is...", feeling broken again. And yet something exciting happened. The press reviews were horribly negative, yet the sales were still rolling in. What was happening? Well, partly it was because this was early 2013, so Steam wasn't stupidly saturated just yet, and people were buying the game simply from seeing it on the Steam front page. But there was also another bigger reason -- we made a decent amount of money fueled by this new thing called "Youtubers". Markiplier made a video that then provoked other people to make similar videos. This spread, and I like to think we played a big part in the Youtuber phenomenon. Watching silly videos of people acting out at No Time To Explain was definitely energizing, and the sales were as good as we could hope for, but I was still too beat up about all the negative press. We'd failed in my eyes, twice in a row. Two years after our Kickstarter, we released a critically failed game on Steam. The comments on videos from people who actually played the game were mostly negative due to technical issues. This leads us to SpeedRunners. I bumped into Casper from DoubleDutch Games at an indie showcase in Hamburg shortly after the release, and played this little game called SpeedRunner HD. I got instantly hooked. Casper explained that this game released on Xbox Live Indie Games and wasn't commercially successful, and they're working on building a Steam version with online multiplayer. What a great game I thought, and what a shame that it wasn't commercially successful. The technology and design behind it were superb - it felt like Mario Kart, but was a simplified 2D competitive platformer. The showcase was part of the Casual Connect conference which was ran by my good friend Luke Burtis. It's an event where people try to sell you services, like traffic or localization -- mostly for the casual games market. Luke put together that showcase for indie devs first time, and was so inspired by the energy of independent game development that he decided to quit his job and go on a cruise to figure out what he wanted to do with life. He invited me & my wife, because our wives are best friends -- and we went straight from the event. During the trip I kept complaining that I didn't want to start another game after the commercially successful (albeit emotionally draining) No Time To Explain launch, and that we didn't have the resources to build a full-on studio to rebuild No Time, and how I really liked the game SpeedRunner HD that Casper showed me. Right there we came up with an idea. We'd reinvest everything from No Time to Explain to help make SpeedRunners a bigger game. Luke would come in to manage the business & partnership side of things, tinyBuild would expand into publishing, and the rest is history with bright orange hats, weird games like Divide By Sheep, Lovely Planet, and more. Now it was me, Tom, and Luke. Based on the design & code of the original game I played in Hamburg, we came up with all of these personalities, characters, stories -- that would tie into the marketing of SpeedRunners leading up to launch. SpeedRunners released in August 2013 (Early Access) and became a Youtuber phenomenon. Everything we made from SpeedRunners, we invested into growth of that game, into helping more developers, and into rebuilding No Time To Explain the way we originally envisioned. It took us four years, but that's ok, it's all been worth it. This was a fun, emotional rollercoaster that's far from over. I don't have regrets about how these things turned out, but it's been a big weight on my shoulders -- I always downplayed the whole situation of why we couldn't build the game properly the first time. I think with the No Time To Explain relaunch on Steam this week, I just felt like I owed our fans an explanation of why the original had so many issues. And now you're getting the game you deserved originally. I'm sorry it took this long. Fail. Get up. Try again. Indie life.